This post first appeared on The Spirit World in September 2006. 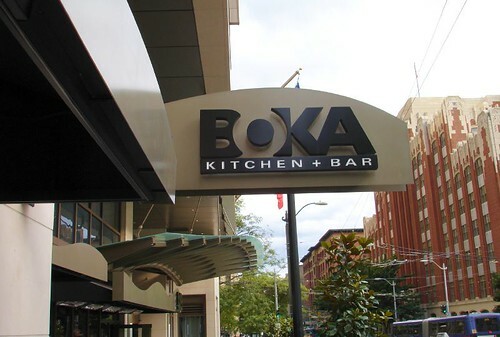 Boka Kitchen + Bar has been open about 2 months now. It sits adjacent to the lobby of the new Hotel 1000 in downtown Seattle. A friend and I decided to check it out a couple nights ago and we were mostly very pleased with what we found! The interior space is very, very designed. By that I mean that attention has been paid to every single detail, which is mostly good but there are a few things that make you wonder, "Why?". There are a few color choices that seem a bit out of place for certain pieces or accessories but overall the place is comfortable and interesting. 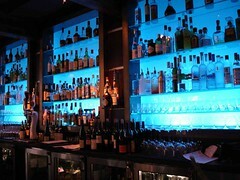 We especially liked the rotating art displayed on two flat screen monitors at either end of the bar. We arrived in time for Happy Hour, which runs from 3:00 – 6:00, I think daily but the website doesn’t say and I’m not sure I specifically asked. Happy Hour includes $3 tap beer; $5 for one red and one white wine by the glass; $4.95 well drinks; and all food on the bar menu at 1/2 price. We opted to try some of the specialty cocktails instead of taking advantage of Happy Hour drink pricing. Our choices included: Fresh made of Plymouth Gin, fresh pressed cucumber, mint, lime and soda; White Peach Cosmo which included fresh rosemary along with white peach puree, vodka and white cranberry juice; and a Lemongrass Drop made with house-infused lemongrass vodka. The cocktails were excellent! The Fresh really was; the Cosmo was kept in balance with the rosemary; and the Lemongrass Drop was a nice alternative to the (often too sweet) Lemondrop. We also tried a couple of their bar bites and were very pleased with both. We had the Crab Cupcakes (notice that says CUPcakes, not cakes) and their Pigs in a Blanket. The Crab Cupcakes are sort of a combination crab cake and cornmeal muffin. You can certainly taste the crab but the corn follows right behind and the cornmeal adds a nice textural element to the whole thing. Pigs in a Blanket is a much nicer dish than you might imagine from the name. The "pig" is BBQ Pulled Pork in a yummy sauce on a little baking powder biscuit. It’s served with a side of coleslaw which, if I hadn’t been sharing, I might have added to the little sandwiches. The staff was very friendly, the barstools comfortable, there was a nice lounge-y seating area and nice touches like purse hooks under the bar. All-in-all we had a very nice time and it will be a place that will be seeing us again soon. In fact, we already have plans to meet there in about 10 days!